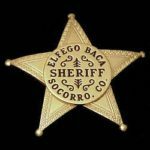 Thanks to Baca’s uncanny marksmanship, sheltering in a Jacal cabin with a sunken dirt floor, and the arrival of a county Sheriff, he survived and was later elected to the Sheriff’s position himself. In 1958, 13 years after Baca’s death on August 27, 1945, Walt Disney was researching famous old frontier legends to create TV programs and Western movies. He came across Elfego’s story and was hooked. He produced a TV series “The Nine Lives of Elfego Baca,” and later a movie. Disney was fascinated with the fact that after the famous shootout, Baca went on to become a lawman, lawyer, and politician. The actor, accurately portraying Baca was Robert Logia. We were fortunate to meet him at the Memphis Cowboy Film Festival several years ago and discussed the series and his thoughts on Baca with him. After reading several articles on the shootout I became very interested in how a 19 year old had acquired such left and right hand dexterity with both handguns and rifles. As I continued to research his life, I found out that, in 1880 he moved with his father to Belen, New Mexico where his father became the Marshal. Being a curious youth I would assume he watched his father practice and probably participated in shooting at various still and moving targets. After purchasing the book “Destined to Survive,” by Robert Alvarado at the Socorro, New Mexico historical and welcome center I found out how Elfego must have learned six-gun mastery. Baca’s grandparents had a cattle ranch and Elfego went to work on it at about age 16. He was on a roundup at the La Parida ranch twelve miles north of Socorro and met William H. Bonney, alias Billy the Kid. According to Baca he and Billy had several adventures together which included gun play. Another gunfighter that Baca got to know was Texas Ranger James B. Gillett through his uncle, Judge Joe Baca. Ranger Gillett was often in the area arranging to extradite prisoners or out of his jurisdiction chasing outlaws. One day soon after, Elfego was at a nearby farm to help thresh wheat. As dinner was being prepared he walked over to a group of boys. He asked one to throw a can into the air. Efuego’s gun appeared as if magic in his hand and when the can hit the ground it had five closely spaced holes in it. The older men looking out the windows observed this display and Uncle Espedion said there might be some use for Baca after all. It was no exaggeration that Elfego Baca was an accomplished gunfighter. South and West New Mexico was thinly settled at that time with farmers and shepherds. Land was cheap and the area was soon used mostly for cattle ranching. Many large Texas outfits moved in along with their “Cowboys.” The ranch hands worked long hard hours with little to do in their off time. About the only thing available was to visit the town, drink liquor, and hurrah the local populace. It must be noted that the war with Texas and the Alamo was still a very sore spot with these homegrown Texans. Elfego Baca was only 19 when he became a Deputy Sheriff in Socorro County, New Mexico. His obtained his gun leather from a local Socorro area saddle maker. It is unknown where he got his guns, but he was able to handle them with cool dexterity and was deadly accurate. Baca was involved in many early scrapes and was, by this time, already known as a gunfighter. Photos of Elfego during this era depicted a smooth faced young man of average height and weight with black hair parted on the left side and trimmed around his ears. He sported a mustache that stopped at the corners of his mouth. The most outstanding feature was his dark penetrating eyes that would seem to unnerve a person that did not know him. In family pictures he dressed conservatively in suits, vests, ties, and often had a jaunty handkerchief tucked in his suit jacket. At that time a cantina owner and deputy Sheriff by the name of Sarracino told Elfego that there were serious problems in his village of Frisco. When asked what he did about it, the Sheriff said he had done nothing. Baca had no patience with law officers that put up with lawlessness and told him so. Sarracino slapped his badge down and told Elfego if he could to better, then do it. Elfego’s answer was to pick up the badge and head for Frisco. When Baca arrived in Frisco he arrested Charlie, McCarty, a drunk cowboy who was shooting at everything that moved. He showed McCarty his badge and took his gun. Friends of McCarty tried to take the drunken cowboy from Baca who opened fire, killing Rancher John Slaughter’s foreman. During the same gun battle, Baca also shot another cowboy in the knee. The local Justice of the Peace would not prosecute and turned McCarty loose. He then wanted to question Elfego about, what he called, the murder of Ranch owner Slaughter’s foreman. The JP sent a second rancher to bring Baca back, who then broke down the jail door trying to get in. There was another gunfight and Baca won, killing the second rancher. Elfego, retreated to a jacal hut that had wooden post walls and a sunken dirt floor, with a solid plank door. The cowboys surrounded the structure taking protected positons to fire into the hut. The villagers reported that there were around 40 cowboys shooting. It was thought that over 4,000 shots were fired at the house. Not one bullet struck Baca, who lay on the sunken floor, firing through cracks in the walls. When Baca shot he was deadly accurate killing four and wounding eight. This is the longest gunfight on record in the old west and the most lop sided. The siege lasted 33 hours with an estimated four thousand rounds fired at the jacal. Soon after, Baca officially was elected as the Sheriff of Socorro County. He immediately obtained indictments to arrest the lawbreakers. He did not have his deputies arrest the wanted men. Instead he sent each of the law breakers a letter. In the letter it said he had a warrant for arrest. It went on to tell them that if they did not give up and come in by March 15th he would assume they would resist arrest and he would shoot them on sight when the deputies came after them. According to historical record the majority came in voluntarily. In 1888, Elfego Baca moved into the positon of a U.S. Marshal. During this time he studied law and two years later he was admitted to the bar. We discussed Baca with his biographer Leon Metz in El Paso, Texas several years ago. Metz wrote a book called “The Shooters.” In the book he said that Baca was controversial. Metz said Elfego drank too much; talked too much; and had a weakness for wild women. Sculptor James Muir, was commissioned to create a bronze statue of Elfego Baca at the exact spot where the Jacal stood during the shootout. Muir spent hours researching the style and type of holster Baca might have worn and statue looks very authentic posted in the center of Reserve, (formerly Frisco) New Mexico. He wears one gun belt around his waist with a drop loop holster for a 7 ½” Colt SAA. The gun belt has several bullet loops in front of the holster. Around his neck, over his right shoulder he wears a second gun belt and holster in a shoulder holster position. Apparently this was a common practice when you expected trouble and did not know how many bullets or guns you might need. We tracked one of Baca’s Colt Single Actions and his jeweled Sheriff’s badge to Ron Peterson who has owned a gun shop in Albuquerque since 1984. Ron has put these items in an Albuquerque museum. 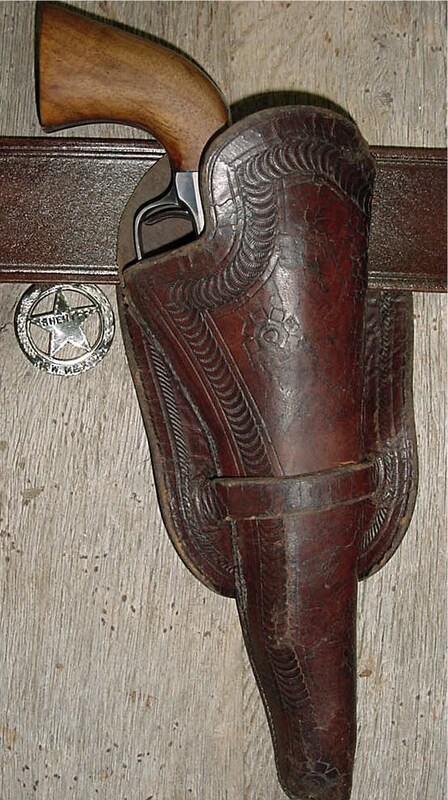 He has also led us to the owner of the 7 ½” Colt used by Elfego on that fateful day of the Frisco Shootout. He has an awesome gun shop and we recommend you visit if you are in the area. Ron’s knowledge of guns is total. With guidance, we obtained two original, authentic holsters created during the Frisco Shootout period. They were made by the only saddle maker in New Mexico around the Socorro area. 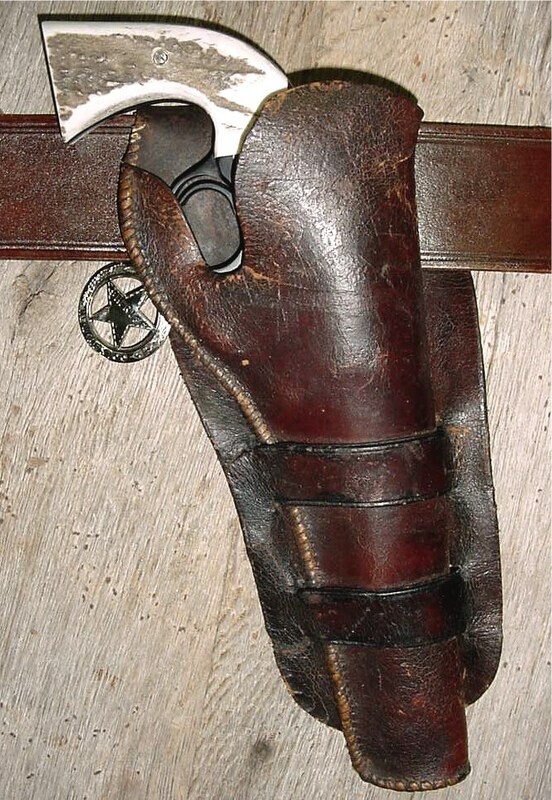 We have used them as the patterns for our Elfego Baca holsters and gun belts, making them as close as one could get to what he wore. Chisholm’s Trail is honored to reproduce both Elfego Baca rigs which can be found under our “Historical” button on this web site. The holster and gun belt title will be called “Frisco Shootout” Give us a call and have us recreate one for you. This entry was posted on Monday, April 15th, 2019 at 10:33 am	and is filed under Uncategorized. You can follow any responses to this entry through the RSS 2.0 feed. Both comments and pings are currently closed.